Despite shares in Money3 Corporation (ASX: MNY) nearly doubling in the last five months to close in on the group’s all-time high of $1.82, Bell Potter analyst, Lafitani Satiriou, is of the view that there is substantially more upside to come. He initiated coverage on the stock with a buy recommendation on Wednesday, supported by a price target of $2.40. If past performance is a guide as to the company’s prospects in fiscal 2017, MNY looks in good shape having delivered a stellar fiscal 2016 result which resulted in its share price increasing from $1.46 on the day prior to the release of the result to hit a high of $1.69. Features of the group’s fiscal 2016 performance included circa 40% growth in revenue, EBITDA and net profit. Gross Loans Receivables increased 27.1% and secured automotive loans increased by 42.1% $251.8 million. There is no guarantee this rate of growth is set to continue, so if considering this stock for your portfolio, seek professional financial advice. Baldwin said he expects to expand the offering of secured automotive finance through all of the group’s distribution channels. He also noted that larger amount longer term unsecured loans continue to grow and represent more than 50% of the group’s branch network loan book. 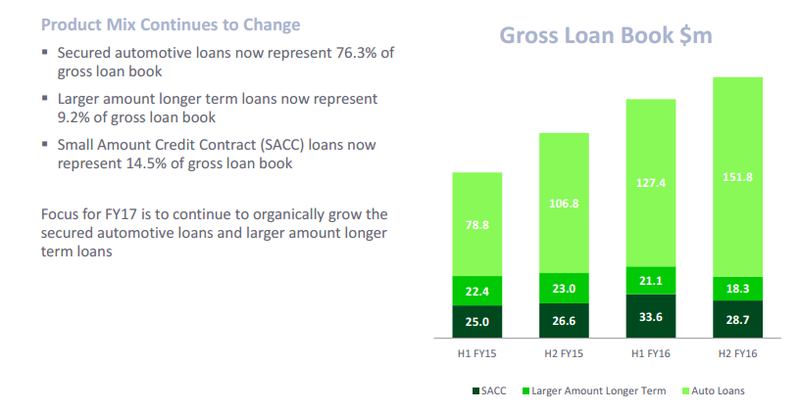 While small amount credit contracts continue to generate solid revenue he expects this area the business to reduce as a proportion of the gross loan receivables and make a lower proportionate contribution to overall income as product diversification increases. Providing further share price momentum at the time of the result was management’s fiscal 2017 profit guidance of $26 million representing year-on-year growth of 30%. Also working in the group’s favour is the fact that it has traditionally been conservative with its guidance, suggesting there could be upside to this figure. However, for the moment Bell Potter has adopted management’s guidance as there fiscal 2017 forecasts. This represents earnings per share of 16.8 cents, indicating that the company is trading on a PE multiple of 10 relative to Tuesday’s closing price of $1.68. The share price retracement that has occurred in the last week could only be attributed to the company’s shares going ex-dividend (October 6: 2.5 cents), suggesting this may represent a useful entry point. Bell Potter’s price target implies 43% upside to yesterday’s closing price. However, the target price appears fundamentally sound as it implies a PE multiple of approximately 14, and this is supported by forecast compound annual earnings per share growth of 14% over the next two years. 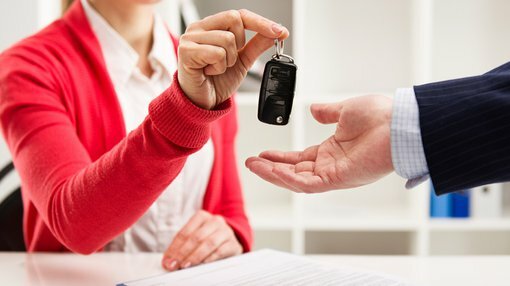 In highlighting MNY’s merits, Sotiriou alluded to the group’s strong growth, as well as pointing to its improved operating leverage as a result of consolidating its lending platform so that the various brands are all funnelled by the one system, a development that should deliver long-term earnings traction. Sotiriou also referred to the group’s new banking facility which could potentially fund entry into new markets, such as moving up the credit quality chain in automotive lending. While such a development hasn’t been factored into the broker’s earnings projections this is seen as a major opportunity.